Grants Cottage is the perfect holiday location to enjoy all that Dartmouth and the surrounding area has to offer. We welcome dogs to enjoy their holiday as much as you do, there are no dog charges and they are welcome in every room. 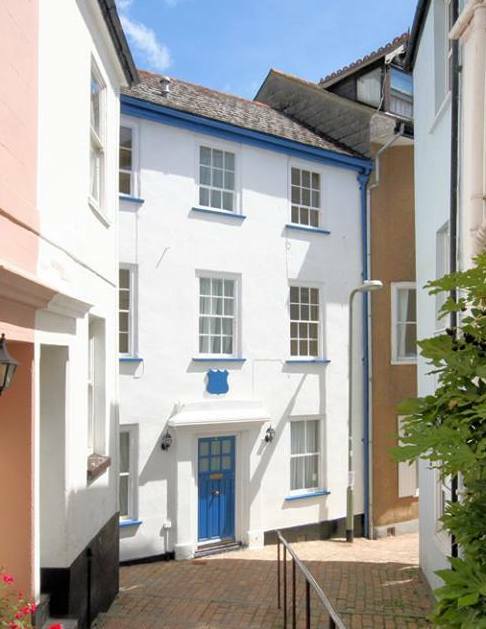 Grade II listed in a conservation zone at the base of Browns Hill steps, commanding unrivalled views up the historic now pedestrian way in the heart of the historic naval town of Dartmouth, in South Devon. We welcome 2 to 8 guests, all dogs of all breeds and offer discounts for couples most weeks. Grants Cottage is a lovingly refurbished cottage full of character features, we provide free Wi-Fi, TVs in every bedroom as well as games and a range of books. Private enclosed courtyard garden an ideal spot for summer barbecues or pre dinner drinks. Cosy lounge with wood burner for winter nights in, a kitchen diner and conservatory leading onto the courtyard garden. All four bedrooms are generous in size and all enjoy views up Browns Hill Steps with window seats to sink in the view. Dartmouth’s unique selection of boutiques, galleries, restaurants and bistros are only moments from it's front door many of which are dog welcoming. We would love to welcome you to stay please contact us if you have any questions.